Fig. 1 The figure is based on a generic adenovirus-specific nPCR as described by Avellon et al. On the left, simple PCR using the outer primers, with 30 (above) and 60 (down) cycles. 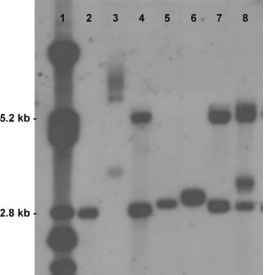 On the right above, nPCR using outer and inner primers as the published method (sensitivity estimated of around 10 to 100 copies/mL). On the right down, nPCR employing outer primers in both reactions. The adenovirus amplification band (168 nt) is found only in the assay reproducing the published method. 3. Polymerase chain reaction operators should be meticulously trained before the initiation of their activity. They are encouraged to wear disposable gloves in each PCR area, changing them frequently, especially when leaving a laboratory to enter another. Equally, they should wear protective clothing in each area. 4. Positive control DNA plasmids should be carefully prepared at a limit of 1 or 2 logs higher than the expected limit of detection, to avoid being the origin of contamination.